We all want our pets to be as healthy as possible, this is why many people purchase a pet health insurance policy for their pets and take them to the vet for routine visits. Obviously your pet’s diet is an important part of staying healthy. If you want to treat your furry family member to a feast for a special occasion, or if you prefer a daily home-cooked diet, here are some tips to ensure whatever you whip up in the kitchen is alright to share with your pet. 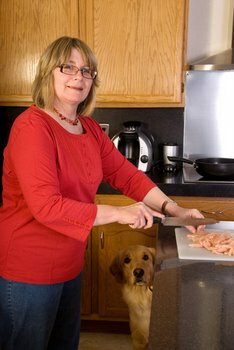 If you are exclusively cooking for your dog or cat, it is crucial that you make it a balanced diet. Cats, for example, cannot synthesize Taurine, and a diet deficient in this will cause heart disease. Commercial pet foods are nutritionally balanced to meet the meets of your pet, if you plan on foregoing commercial pet food completely, talk with your veterinarian about supplements you will need to add to meals you cook to create a balanced diet. This can be hard work, and is important that it is done right. Dogs are actually not obligate carnivores like cats are. A healthy canine diet should consist of a variety of foods, including vegetables and grains, in addition to meat. Raw food diets are controversial in the veterinary world. The bottom line for feeding raw foods is that uncooked meat can carry harmful bacteria, such as salmonella and E. Coli or even internal parasites. Ideally meat and egg type ingredients should be cooked to prevent potential GI disease. Almost everyone knows that chocolate is toxic to dogs, but did you know you should also avoid grapes, raisins, macadamia nuts, onions and garlic? Dogs are smart! If you whip up a fried egg every time they refuse their kibbles, they will quickly learn to turn up their nose to dog food. In a sense, Fido is training you! Most dogs will eat when they are hungry, and refusing a meal might just be due to being full. Of course, if your dog is generally an enthusiastic eater and suddenly starts to refuse food, this could be a sign that something is wrong and you should consult with your veterinarian. Having a dog or cat insurance policy may help with diagnostic and treatment costs. Pet obesity is unfortunately a pretty common problem. Some estimates suggest up to a third of cats and dogs in the US suffer from being overweight. Obesity can cause a slew of health problems and can ultimately short your pet’s life. Visit www.petfit.com or www.petobesityprevention.com for tools to help you determine the right amount of food for your pet. Your veterinarian should also be able to calculate the right daily caloric requirements; the amount may surprise you! Cooking for your cat or dog is a nice way to show them you care. If you are planning to cook every day, be sure to do your research, it can be fairly involved to ensure a balanced diet. If you are just interested in a special feast for a birthday or to celebrate graduating puppy classes, using these tips can help ensure a safe and yummy meal that is guaranteed to bring a smile. Learn more about pet health and the benefits of cat and dog insurance today.